Ancient Vulcan telepathic weapon. Kills by magnifying aggressive and violent thoughts, but can be blocked by peaceful thoughts. Place in hand until played as an Event card. Kills everyone in an Away Team without Youth or CUNNING > 7. Discard artifact. This Card-Review article was written by Kathy McCracken and was published first on "Major Rakals Tal Shiar Headquarters (members.cox.net/majorrakal)" at Mar 3rd, 1997. Previous "Romulan Review" (# 11): "RR #11: Romulan Ambush". Next "Romulan Review" (# 13): "RR #13: Royale Casino: Craps". Aefvadh! 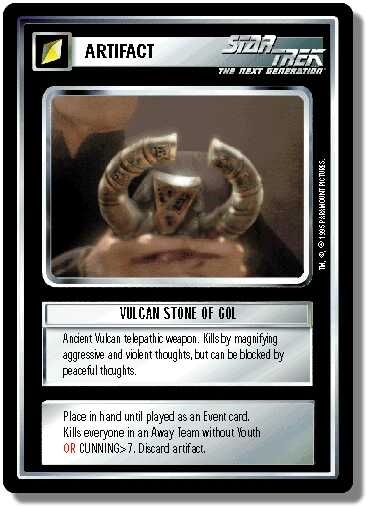 Let's investigate the uses of an artifact created by the Romulan's ancestors, the Vulcans, in their pre-Surak days. First, the limitations. It specifies an Away Team, so you can't use it on a ship's crew. And you must somehow get your opponent's Away Team stopped, because you can only play this on your own turn, barring a serendipitous Manheim’s Dimensional Door temporal hiccup. Finally, its usefulness may be badly diminished by the presence of PADDs, Yellow Alert , or Lower Decks . Pluses: It can be used by Feds to kill without doing battle. It's possible to drain CUNNING selectively with Brain Drain , and across the board for Non-aligneds with the Humuhumunukunukuapua’a fish card. 40 personnel (49%) will be killed, nearly all uncommon or rare. Although many of the best bridge crew will survive (Jean-Luc Picard , Geordi La Forge , Data , Beverly Crusher ), you will lose Deanna Troi or Major Rakal (likely source of Empathy), both Tashas, and Worf (all your best SECURITY). 35 personnel, a whopping 80%, of the dim-witted Klingons will be toast. This includes all but one common, and all SECURITY and MEDICAL save Divok. Lower Decks won't even save most of them. Of rare Klingons, Gov. Worf, Gowron, Kurak, and Kurn are among the dear departed. Good for some Death Yells, but not much else. Ah, only 12 (35%) Romulans aren't bright enough or young enough to live. Although this includes all SECURITY and MEDICAL except Taris and the holo-Jera, Lower Decks (frequently used for a universal Integrity boost) or even Yellow Alert will save most of them. Among rare Romulans you will lose only the Tomalaks and Mendak ; the much more useful women will all survive. 17 (41%) will die, including Berlinghoff Rasmussen, Tarmin , Zon , and Mortal Q (great way to keep your opponent from playing Immortal Again to reopen his Q Continuum). But you can make it even worse by playing Humuhumunukunukuapua'a on the Away Team's location before playing the Gol Stone; it drains your opponent's non-aligneds of 4 CUNNING each, so the Stone will claim 83% of them (all but 7). In summary, best used against Klingons, and Non-Aligneds with a Humu fish; not as effective but still damaging to Federation; and much less effective against Romulans. Appropriate, considering its origin. Keep a Disruptor Overload around just in case your opponent favors PADDs, and a Q2 in case he tries to KU the Stone. Oh, and to stop the Away Team, try any wall dilemma. Vulcan Stone of Gol + multiple Brain Drains + Humuhumunukunukuapua'a fish.